You need to capitalize on this pricing mismatch right away. Prices for graphite were some of the last to respond to the commodity supercycle. But graphite — essential for making both steel and the batteries of tomorrow — lagged behind. Gold ran from below $400 to over $1,800 an ounce and copper went from $1.00 per pound to almost $5.00 — both increases of several hundred percent. 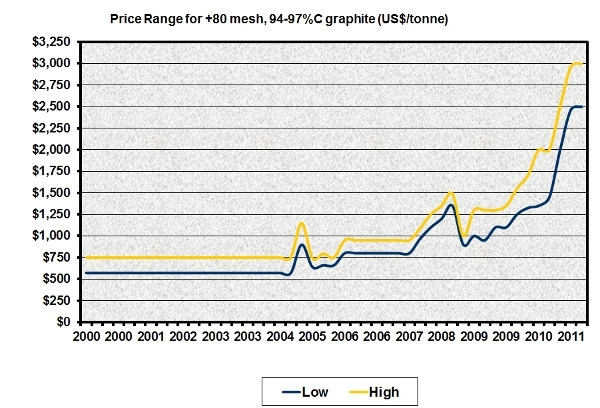 But graphite prices remained relatively flat, trading between $1,000 and $1,500 from 2005 until the last couple years. Once the world realized graphite was in the same position as rare earths (that demand was and will continue to rise, but supply was controlled by the Chinese), prices took off quickly. It was when the price for the commodity was rising that I started telling you to buy graphite mining stocks. Whenever the price of a commodity rises as dramatically as it did with graphite, inevitably companies try to find more graphite to mine. Makes sense, right? If the price is flying, why not mine it and sell it? Well that's exactly what happened. Before graphite prices took off, there were only a couple graphite companies outside of China. Now there are 36. But the one to buy is still the one I went to visit late last year, when this bull was just getting started. When a market gets this hot, some companies will do whatever it takes to get on the bandwagon and attract shareholders: They'll change their name or they'll give grandiose projections about a mine that hasn't even been tested — all in an attempt to inflate their share price in a currently hot industry. Remember the rare earth boom? But this graphite company is simply restarting a mine that was already in production. Mining stopped there decades ago because graphite prices were in the toilet. The mine it owns has already been thoroughly tested. And it's closer to new graphite production than any other company outside of China. In fact, the company just released a bankable feasibility study for the mine. It's a third party evaluation of reserves and potential profitability. This is the document on which the National Instrument 43-101 will be based. That's the document that Canadian public companies must file to ensure they aren't lying to investors. The conservative estimate is that this company has at least 470,000 metric tons of high-quality graphite. So to put a total value on the mine, we have to multiply that by the current price of $2,600 per tonne. Right now, if graphite prices remain unchanged, this company is sitting on AT LEAST $1.22 billion. It could be much more than that if the price of graphite rises, as expected. And that's why this is one of the worst pricing mismatches I've ever seen. As I write, this company's entire market cap is only $46.9 million, or 26 times less than the graphite it's proven to own. A major securities firm just ranked every non-Chinese graphite mine in the world. There were 98 mines owned by 36 companies. This one was ranked number one in terms of size of the deposit, graphite flake size, purity, and progress of the mine. It was rated as a Buy with a 12-month price target of $3.00 — yet it's currently trading for a buck. It's been called a "miracle material" and "the newest next big thing" by scientists and market analysts alike. But more important than what it can do for energy and technology is what it's going to do for investors. I firmly believe graphite miners are about to experience the thousand-percent run-ups witnessed by rare earth companies over the past few years. Editor Keith Kohl takes a minute to explain why we can't count on Saudi Arabia to solve the world's pending oil crisis.